Abrasive Cords and Tapes debur curved surfaces and holes. Fully impregnated with aluminum oxide or silicon carbide abrasives, cords and tapes are suited for deburring, grinding, and finishing contours, holes, and slots on machined and cast parts. Heavy-duty, flexible products fit into contours and holes inaccessible by files and rigid tools. Abrasive Cords are available in 0.012-0.15 in. OD sizes, and flat tapes measure 1/16-Â¼ in. wide. Products also remove corrosion and rust from valves and fittings. A full line of heavy-duty, flexible abrasive cords and tapes for deburring, grinding, and finishing contours, holes and slots on machined and cast parts is available from E.C. Mitchell Co., Inc. of Middleton, Massachusetts. Mitchell's Abrasive Cords and Tapes are fully impregnated with aluminum oxide or silicon carbide abrasives and come in a wide variety of sizes to fit into contours and holes that are inaccessible by files and rigid tools. Ideal for deburring, grinding and finishing metal parts, they are flexible for working on curved surfaces, yet stiff for reaching into holes and slots. Designed to match a variety of manufacturing and maintenance applications, Mitchell's Abrasive Cords are available in sizes from 0.012" to 0.15" O.D. and the flat tapes are 1/16" to 1/4" W; packaged on handy spools in 50 ft. lengths. They can also remove corrosion and rust from valves and fittings and are useful for cleaning rusted pipe threads and related parts. 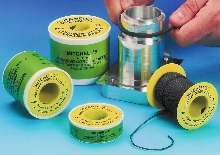 Mitchell's Abrasive Cords and Tapes are priced from $12.00 up per spool. Literature is available upon request.